Why, we go to sea. The Boat arrived here in the Fall, towed up onto the property on an unplated trailer by 80 year old Jack in his one ton truck. Brett and I pulled it by hand the last hundred feet to the Room of Requirement. Opening both french doors wide we ferried her in. And for a few months now she has slumbered. The nights long, the air chill. The cats climbed on her and sometimes we checked in. But mostly she just slept. Jack has visited a few times and on each occasion he’s asked if he could visit her, just to see, just to lay his hands. Walking about in the Room of Requirement, he’d gaze at her and touch her and he was pleased. She’s just a Penguin Dinghy, if that. She was built for placid eastern waters and can hardly withstand the gusts on San Francisco Bay. On top of that what’s left of her is covered in lichen. Her stern has been plowed with gashes. What to say? She may be more hole than anything else, but can any absences stoved in upon her negate her right to existence? All the while Brett has been away out with the wind. He restored a barn in Bolinas, and served at a Vipassana retreat and painted a mural and went to a movement workshop at Tamalpa. He got a girlfriend and got a plan which shifted into another. All good stuff. The days have started to grow longer. The daffodils and narcissus have come up, the locust is in full bloom along with the magnolias. Spring appears at last to be here. And now Brett has returned home. 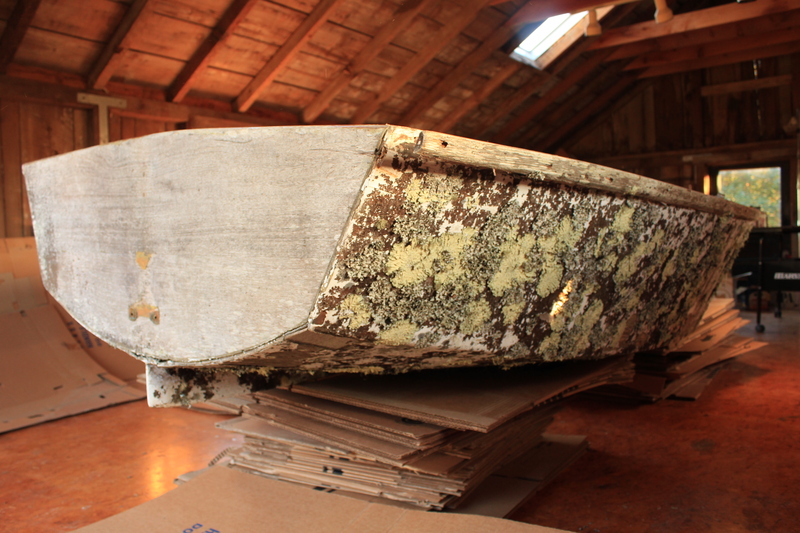 Time has come for the restoration of the Boat. The boat that came from Arlo Guthrie’s house. The boat that rotted in Jack’s yard in Marshall for thirteen years. The boat that harkens to an ancient childhood memory that belongs not to me. Why do you assume any task? Why do you refurbish or refashion anything? Why with all the things yet to be done – rooms still to unpack, months of bookkeeping, gardens to be planted, work work work to be done, have we taken on this project? But we don’t have an answer. There is no why. We do it because it’s there to be done. And a faint trust in the belief that beauty near always arises from the foolish act. This entry was posted in The Boat and tagged Arlo Guthrie, boat restoration, Bolinas, Brett Baer, Jack Elliott, Marshall, penguin dinghy, Ramblin Jack Elliott, RDI, Sebastopol, Tamalpa Institute by Andrew Lewis. Bookmark the permalink.